Note You need administrator rights to create custom fields. Custom fields are available for all InLoox PM versions and for InLoox now! Enterprise version. If you have admin permissions for InLoox, you can create your own custom fields for new columns in the planning list. In Outlook, open the by clicking on File and on InLoox Options. 1. 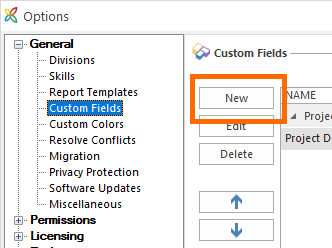 Click on Custom Fields and then on New to create a new type of custom fields. 2. 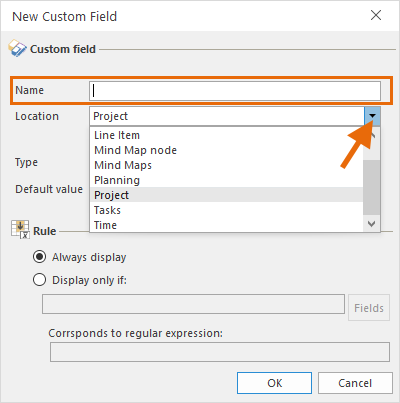 Name the new custom field and choose the Location where in InLoox the custom field shall be displayed. 3. Then select the Type of custom field. You can choose from Text, Date, Integer (number), Decimal number, Checkbox, List, or Currency. 4. 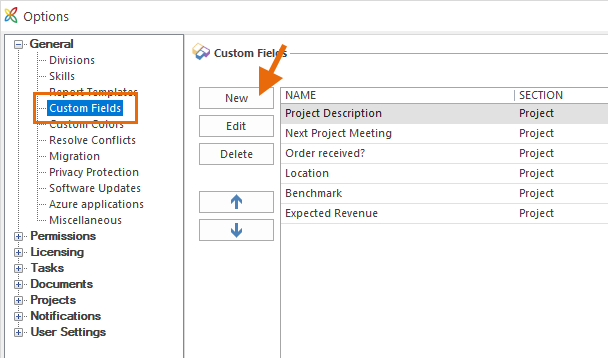 Then enter the Default value that will automatically be displayed in the custom field. Click on the edit Symbol to open the window to edit the default value. 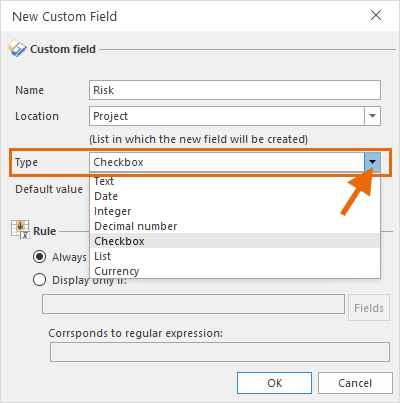 In this example, the custom field type for the custom field Risk is List and the default values are High, Medium, and Low. The InLoox users can select one of these three values in InLoox Projects to highlight e.g. high-risk projects. You can allow InLoox users to leave the custom field empty by setting a check mark at Allow empty selection. 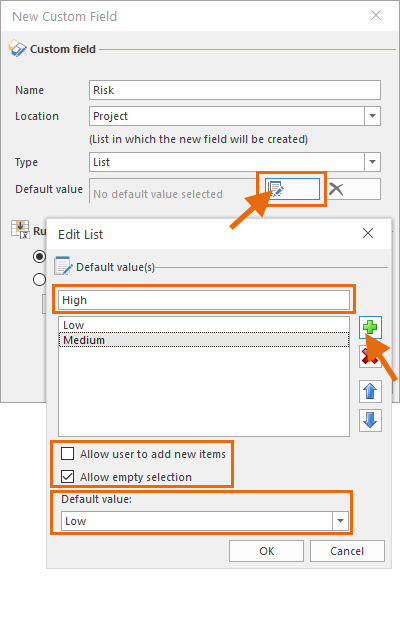 If InLoox users should be able their own values, set a check mark at Allow user to add new items. Beware, however, that allowing this kind of individual customization may cause confusion. 5. Per default, the newly created custom field ist always displayed. 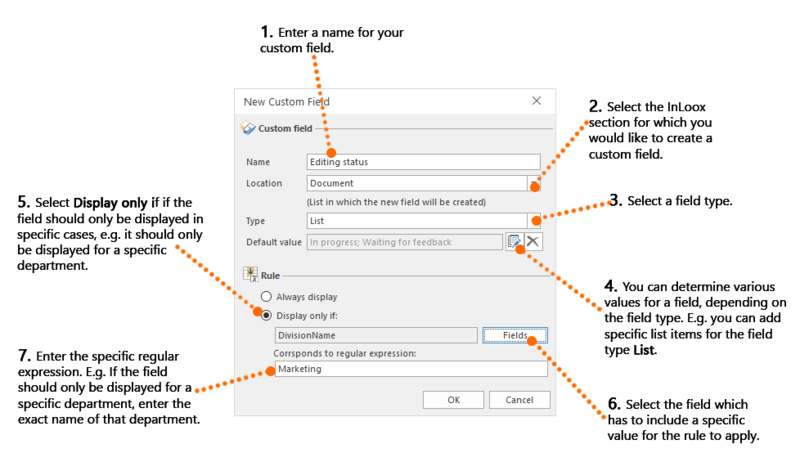 If you want to set a rule for this custom field, select Display only if and follow the instructions below. 6. 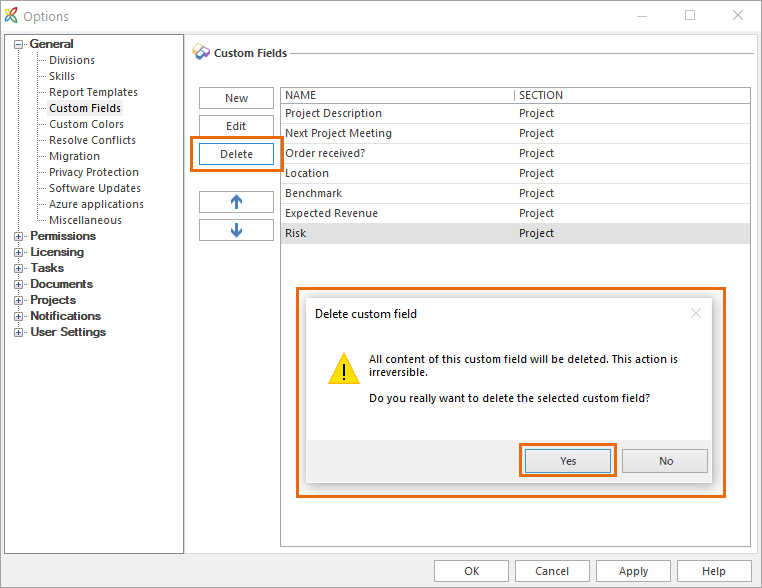 If you want to delete custom fields, mark the field in the overview list and click on Delete. 1. Give your custom field a unique and easily distinguishable name such as "Editing Status Documents"
- For example, the first entry could be "In Process". Confirm with Enter or click on the green plus icon. - Other list entries could be "In Review" and "Final"
- Select which entry should be the default selection, in our case it's "In Process"
4. Now define your rule. In the editing dialog, select "Display only if"
6. Enter the exact name of the division, i.e. how it is saved under "Divisions" in the InLoox Options - in this case "Marketing"
How to create custom fields | InLoox 10 • Copyright 1999-2019 © InLoox, Inc. All rights reserved.